It is with heavy heart that we mourn the loss of Mrs. Janet Hankin, long-time friend of the Horsham Lions Club. Mrs. Hankin’s contributions to the Horsham Lions, some intangible, some monetary, are innumerable. We have truly lost a gem. CLICK HERE for the obituary from the Intelligencer. In 2004 the Horsham Lions awarded her their highest honor, by giving her the Melvin Jones Fellowship. This award is only given to those individuals whom Lions hold in high esteem and have contributed selflessly to helping others. Several Horsham Lions have been family friends of the Hankins over the years. Carlo Logiovine represented the Horsham Lions at the funeral service and at her daughter Minna’s home following the service. For many years the Lions have been running a fundraiser by parking cars on Mrs. Hankin’s property during the local Air Show events. This generosity has helped us raise tens of thousands of dollars over the years, all of which she was thrilled to see given to those in need. As if that were not enough, her most recent generous donation to the Horsham Lions even further enabled us to assist those in need. A scholarship in her name has been created. Each year the Horsham Lions grants a scholarship bearing her name to a deserving Hatboro Horsham High School senior who shows outstanding service-oriented qualities. 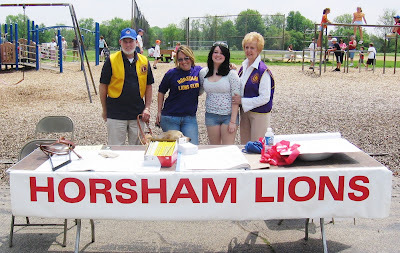 The Horsham Lions Club was on hand at Simmons Elementary's Spring Fair on May 12th. The fair is held each year to raise funds for the Home & School Association. The Lions were there to meet the community and try to drum up interest in Lionism. Lions Tara Smith, Ted and Shirley Truver, John Bill and Andy Weiss helped staff our table, where we handed out pencils to the children and Lions literature to the adults. Tara's daughter, Becky, came to help out as well. Becky received a scholarship from the Horsham Lions back in 2005. Roger Weiss, a vision-impaired friend of the Horsham Lions, was also on hand. The cost of raising and training his Leader Dog, Layla, was partially funded by the Horsham Lions. Roger and Layla gave the children a chance to learn about Leader Dogs and about people with vision impairment. Pictured left to right are Roger Weiss, Tara Smith, Becky Smith, Shirley Truver.